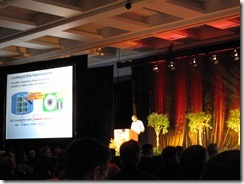 David Dewitt presented today’s keynote. He promised to be detailed and he delivered! The tweets were all about the great info he presented and if his presentation would be on the PASS Summit DVD. David drilled into a level of detail and people were eating it up (they also want to see his presentation again so they can take it all in). 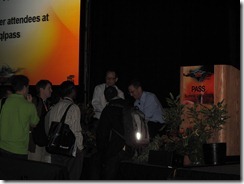 Drum roll, please……David’s keynote WILL be included on the PASS Summit 2009 DVD set. David’s presentation was so interesting that some of his followers stayed after the keynote for an impromptu Q&A. 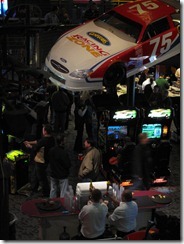 On Wednesday night, PASS attendees were invited to join PASS and Microsoft at Gameworks for some games and fun. Ted Kummert announced prize winners for various contests happening during the summit. There was one list of winners that were not announced last night, so I wanted to recognize them now – the winners of the SQL Server Twitter contest. Again, drum roll please…..I am excited to announce the three winners of Xbox 360 Elite consoles. Congratulations! We will ship your Xbox 360 to the address on your contest form. To keep up with the happenings of the SQL Server team, follow us on Twitter (MS_SQL_Server) and Facebook (MS SQL Server).